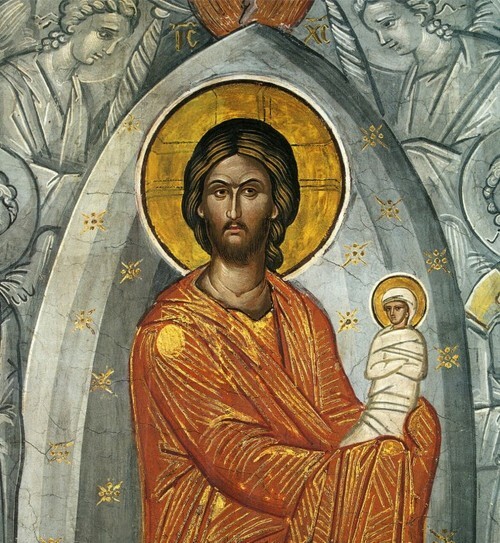 In a powerful inversion of the Nativity (Christmas) icon, here Christ is shown in glory receiving the eternal spirit of his Mother in the form of a newborn babe. I will have more to say about this extraordinary iconographic tradition in a later post. The rules of fasting, especially for Lent and the Dormition fast, are so severe that very few people observe them. Various compromises are made by Orthodox people and the clergy who advise them. One is justified in asking: Why not modify the rules so they can be more realistic? Indeed, why not? Because almost everyone in the Orthodox Church is afraid of upsetting the monks and the few traditionalists out there. Also, there is a feigned fear of changing anything that the Fathers and the Ecumenical Councils set forth. That is unfortunate. As a result, we don’t change the written rules, but change and even ignore them in everyday practice! God’s ideas about fasting seem quite different from our own. God seems to care more whether our fasting leads to awareness of what’s around us and how we relate to others. God’s priorities are clearly different from the priorities of monks. So, before you fast, read again these words from Isaiah and contemplate how fasting can help you become more actively involved in the lives of others and how you can contribute to improving your little corner of the world. Don’t worry about following rules that are too hard for you to observe. Let your fasting from food be sincere. Let your fasting be guided by a love of creation and a concern to eat food that is simple and free of harmful pesticides and additives and destructive farming practices. Let these concerns lead you on a search how to make your eating be in greater harmony with God’s concern for all life. You can make your fasting immensely meaningful by learning how food comes to your local supermarket and dining table. And August is the perfect month to support your local farmers market. Yes, it costs more to buy from farmers, but at least you know where your dollar is going and who is benefiting from it. If it costs a little more than what you buy at the supermarket, it might make you more cognizant about what and how much you eat. And that too, is part of the spiritual benefit of fasting. Anything you learn along these lines will elevate your fasting to what God wants it to be. Before you fast, read Isaiah 58 and think deeply about it. 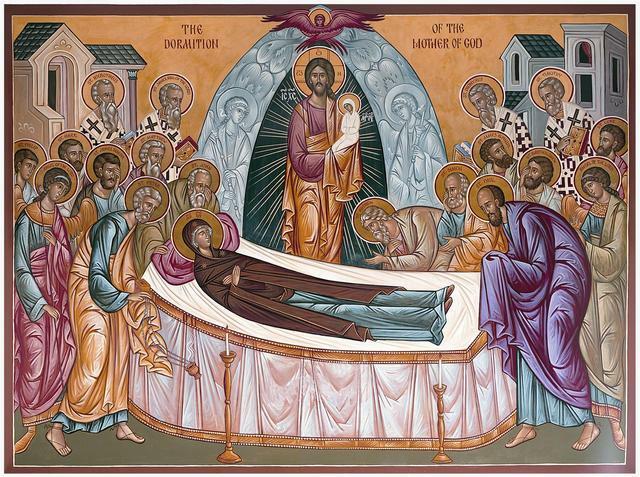 May God bless your Dormition fast and your growth in godly awareness. Categories: Uncategorized | Tags: Assumption, Dormition of Mary, Fasting, Isaiah 58 | Permalink.